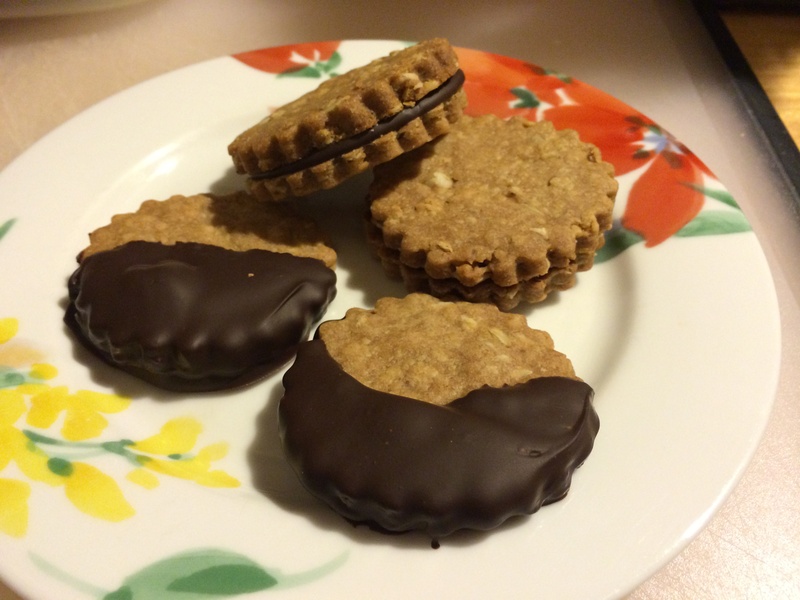 I was more than happy to make another dessert/snack that required rolled oats! (I’m almost down to one container.) I also thought these cookies would be perfect to mail to my brother for his birthday. He’s a very busy person who eats at least 3 forms of peanut butter and jelly everyday. Since, his cabinets are full of different jellies, hazelnut spread, peanut butter, almond butter, etc., (If you are going to eat three PB&J’s a day, you need variety!) I left the sandwich filling up to him. The heart sandwich cookies were very easy to make. I did use dark brown sugar, because that’s what I had. The dough was a little darker than those in the Everyday Food issue, but the taste probably didn’t change that much. Holy Moly, was the dough hard after I took it out of the refrigerator! I had to let it sit for over 30 minutes before I could roll it. I decided not to use a heart cookie-cutter, since I would be sending the cookies to my brother. I also had to bake the cookies longer than the recipe said. I am to blame for that because I’m not good at rolling thin cookies. My rolled out dough is always thicker, maybe I need to keep a ruler in the kitchen. The final product was pretty good. I had a plain cookie and decided it tasted a lot like shortbread. Which makes sense since there is 1.5 sticks of butter and a decent amount of sugar in the cookies. I did find that the cookies were a little salty. I would recommend decreasing the amount of salt. My husband made a grape jelly sandwich with the cookies. He said it was good but the jelly was rather messy. So I decided to dip the cookies in some melted semi-sweet chocolate and make some sandwiches with the melted chocolate. The hardened chocolate went well with the cookies and prevented a gooey mess while eating the sandwich cookies. Overall, the sandwich cookies were fine, nothing special.